Buying an engagement ring can be a joyful, but difficult, decision. From learning about diamond quality to finding a style that will be current today but also stand the test of time, there's a lot to learn and consider. Innovative jewelry designer Kenneth David, founder of Kenneth David Jewelry, shares information about his "Fifth C" philosophy for buying the perfect ring. When most men first consider buying an engagement ring, they study the four Cs of diamond quality: clarity, cut, color, and carat. Kenneth David believes that the most important step adds a fifth C to the process: connection. His tips can help you choose the perfect ring. LoveToKnow (LTK): Please define your concept of the Fifth C of diamond quality. Kenneth David (KD): Shopping for the perfect engagement ring can be challenging for many men. In fact, when purchasing a diamond, for most men, the four C's quickly become "confusion," "challenging," "chaos," and "cost." I developed the Fifth C - connection - to highlight the most important yet most often ignored C, which is the emotional connection between a couple that the diamond engagement ring ultimately represents. LTK: How do you suggest gentlemen make that connection before buying an engagement ring? KD: The key to any good marriage is knowing your bride. The same is true when picking out that special engagement ring. The most important thing to think about is how this design connects to your special someone. If your bride-to-be is bold and outgoing, you may want to choose a big, bold design with a lot of diamonds surrounding the center stone. If she fairly conservative and demure, you may want to pick a solitaire bezel-set close to the finger. Purchasing an engagement ring is similar to marriage; couples should give it some thought and look before they leap. Remember that you will have this symbol of your love forever. LTK: How did the concept of the Fifth C helped you when you were shopping for your own wife's engagement ring? KD: When I was shopping for a ring, I just kept in mind the special connection that my wife and I shared and combined this with both of our personalities, our lifestyle, and budget. It's very true that you never truly pick a diamond, but rather the perfect diamond picks you. Just like your soul mate, you will know when you find it. Since I was in the jewelry business at the time, my wife felt comfortable with me choosing the setting and diamond and surprising her. I have since reset the stone twice. 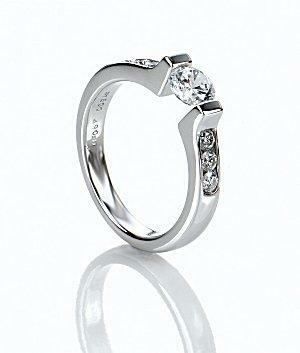 Tastes change and it is fairly easy - and fun - to change a ring and reset the center diamond down the road. LTK: There are so many styles out there, that choosing one can get overwhelming. Is there any ring design that, over the years, you've noticed is popular with many different couples? KD: There has been a resurgence of classic cuts and settings. 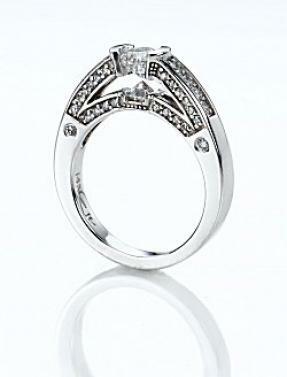 The classic, round, brilliant-cut diamond set in a Tiffany-style four- or six-prong mounting is the traditional choice. There is also a resurgence of the emerald, princess, and Asscher cut diamonds. LTK: Do today's brides prefer a radically different ring than years ago? KD: Trendy pieces tend to fade in popularity rather quickly, whereas classic pieces and one-of-a-kind looks typically stand the test of time. Updating classic pieces with a modern twist is a great way for couples to infuse their own personality into their symbol of love. For example, antique designs are now being combined with colored stones, such as rubies, emeralds and sapphires, but with a more contemporary slant. It's all about personal style. LTK: You chose your wife's ring for her, but that might not be appropriate for every couple. Would you recommend using an engagement ring as a surprise, or should the couple shop together? KD: I still think most women are traditional in that they like the element of surprise. With this in mind, engagement rings should serve as a symbol of a couples' love and connection to each other. Just as couples feel a magical connection to each other, grooms should find a ring that truly symbolizes the bond that forever unites them with their bride. However, this is a decision that you will have to live with for the rest of your life, so for men that aren't totally sure, discuss it with your fiancée-to-be. She will defiantly let you know which ring best suits your style and budget as a couple. Whether you shop for an engagement ring together or as a couple, remember that the ring is more than just a piece of jewelry. It's a symbol of your love. Choosing the perfect engagement ring is about celebrating your connection.